All it takes is 5 ingredients and 5 minutes to make this very versatile Roasted Red Pepper Spread! Great on sandwiches, crackers, or as a dip! When I lived in Utah, there was a store called Great Harvest Bread Company. I would go there often for lunch. At the time I was a vegetarian so my go-to sandwich was cheese and vegetables. I forget the name they gave it, but my favorite part was the roasted red pepper spread. That particular store closed and the other local stores in the chain didn’t make that sandwich. I assume they are all individually owned and operated. It has been years since I’ve lived out West. Actually, it’s been exactly 7 years since I moved away from Utah. While I don’t miss much, every once in awhile I will randomly crave that sandwich! 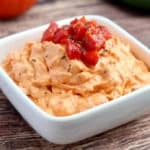 Now, 7 years later, I finally made my own version of Roasted Red Pepper Spread and it only takes 5 minutes to make it! I honestly can not say if it’s a comparable duplicate for the original since it’s been so long. However, I can say it’s pretty darn good! And, I still enjoy it on a vegetarian sandwich or wrap. It’s actually a really versatile spread and can be used on sandwiches and wraps that also have meat on them, as well as crackers. I think it even works great as a vegetable dip! 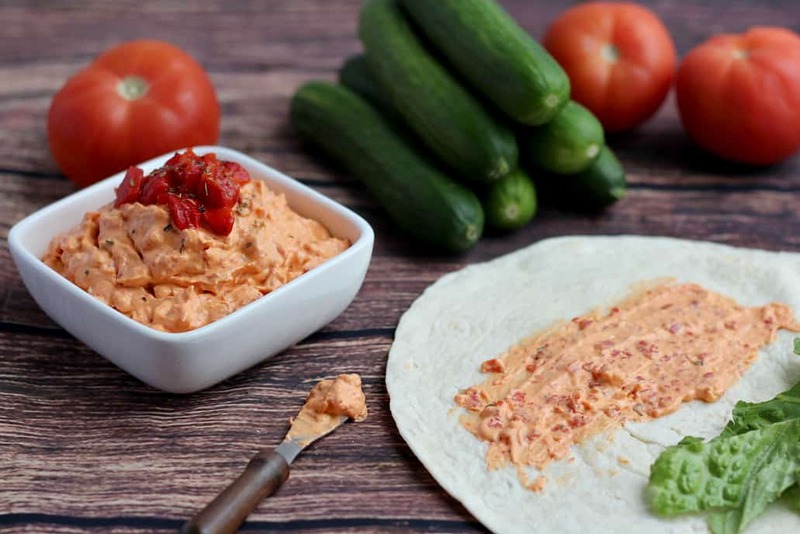 My Roasted Red Pepper Spread recipe is so simple – 5 ingredients and 5 minutes is all it takes! What prep? Just get out your food processor or blender, measuring spoons, and all the ingredients! Toss all your ingredients into your food processor bowl or blender cup and process until you reach your desired level or chunkiness…or smoothness! 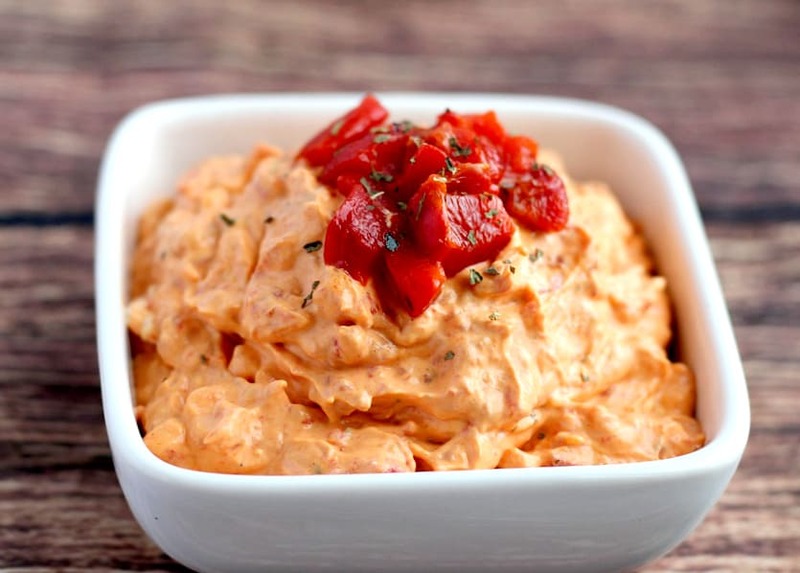 If you are going to be setting this Roasted Red Pepper Spread out as a dip or for guests to use on crackers, it’s easy to fancy it up a little bit! You can spoon it into a nice serving bowl, add a few extra diced roasted red peppers on top, and a sprinkle of basil. Store any extra Roasted Red Pepper Spread in the refrigerator. I’d love to hear any additional uses you guys come up with to use this spread! Leave a comment below if you try it! All it takes is 5 ingredients and 5 minutes to make this very versatile Roasted Red Pepper Spread! Use it on sandwiches, crackers, as a dip and more! Add all the ingredients to a food processor or blender and process until you reach your desired level of smoothness. You can use roasted red peppers from a jar to save time, or roast your own. Either way works great in this particular recipe. Use this spread on sandwiches, wraps, as a dip, or even mix it into hot pasta to create a Creamy Roasted Red Pepper Pasta. Store any leftover spread in an airtight container in the refrigerator. Use within 7-10 days for best results.